Tarpon fishing in St. Petersburg/Tampa Bay with Captain Wade Osborne is an exhilarating experience. Although a few juvenile tarpon reside in some Tampa Bay rivers year-round, Osborne prefers tarpon fishing April through October and especially during their May, June and July migratory run when the largest “Silver Kings” prevail. 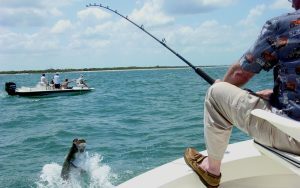 During this migratory influx, tarpon fishing reaches its peak. 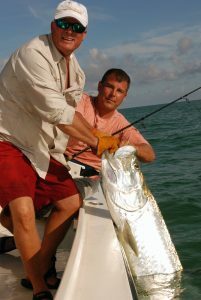 Tarpon weighing between 90 to 165 pounds are common with the occasional tarpon weighing close to 200 pounds. 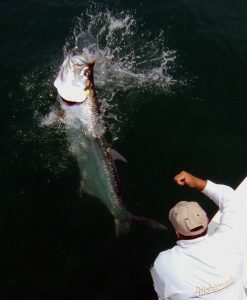 Tarpon tackle can vary depending on the request or skill level of the client and Osborne provides only the best. A Sage 12 weight fitted with a Tibor Gulfstream reel, equipped with a Black Death fly is a perfect match for the seasoned fly aficionado. However, a much more forgiving method, but just as thrilling is the use of spinning tackle. Osborne relies on 8ft. G-Loomis Surf Series rods fitted with a Peen 6500 Spinfisher reels, loaded with 300 yards of 50 pound PowerPro fishing line. 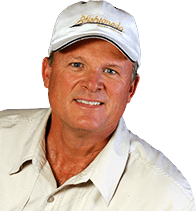 Preferred live baits are crabs, threadfins, scaled sardines, shad, and pinfish. 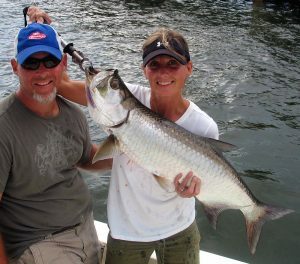 The majority of Afishionado Guide Services’ tarpon fishing charters consist of cruising the Pinellas and Manatee county shoreline with the rising sun. Once situated, Osborne scans the horizon in search of rolling or daisy chaining tarpon. The boat is then positioned to let t he tarpon approach for a prefect cast. Other times, Osborne anchors the boat in tarpon travel corridors and uses fresh cut bait. Once a tarpon strikes and realizes it’s hooked, it shoots towards the sky in an effort to dislodge the hook. A phrase synonymous with tarpon fishing is “bow to the king.” Basically this means, lower the rod tip and point it at the tarpon when it leaps into the air. By doing so, the tension on the tarpon isn’t as great and the hook is less likely to come back at you. Catch and release, however a $50 tarpon tag is required for weighing fish during tournaments or for harvest.